This is Cedar Hill Country #4. My mom asked me to stitch this for her to incorporate it into a quilt piece. I saw this done by my friend BarbH. and immediately knew I had to do it up. We both chose colors to our liking. I chose a NN green and a Weeks color. This is Courtney Collection's Simple. 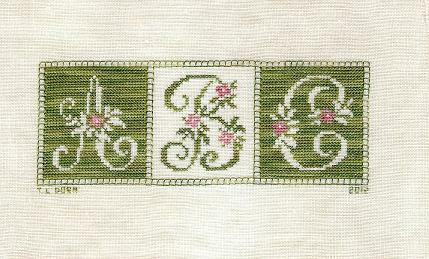 And it's just that....a simple but beautiful stitch design. First off, Mom, if you're viewing this before mother's day leave now....;)......................waiting for you to exit ...............(lots of dots since I can't seem to get blogger to let me put a space between paragraphs) .................................... Anyway, These are the items I stitched and finally got put together for my mom for mother's day. The Carrot is an etui(holds stitching items) but can also be stuffed and closed up to just be cute. I have the rabbit thread winders, needleminder and scissors with fob to go with it. The floss cards were made by Michelle at Raspberry Rabbits Ltd where I purchased the scissors that mom just so happened to point out to me not knowing what I was already making for her...Perfect isn't it? I also made up Cherished stitches Sentimental thimble case(she's a quilter) and just got it put together.